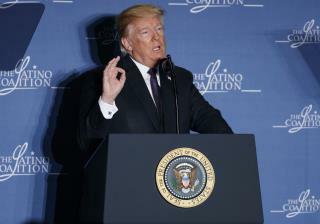 (Newser) – President Trump is expected to formally sign off on his steel and aluminum tariffs Thursday afternoon at a White House ceremony with steel union workers, reports the Washington Post. However, it appears the White House is giving ground on its initial defiance about exemptions. Trump trade adviser Peter Navarro told the Fox Business Network Wednesday night that Canada and Mexico would be exempted, at least initially, reports the New York Times. Whether they remain exempt would depend how much they bend in the current renegotiation of NAFTA. Earlier Wednesday, White House spokesperson Sarah Huckabee Sanders suggested other nations could be exempt, too—decisions would be made "case by case" and "country by country," she said, per the AP. See ALL President Trump is doing what's for the Good of the USA & it's Legal Citizens! A lot do not comprehend here cause of their severe TDS. This was all about other countries DUMPING Steel & Aluminum on The USA. This is known as “dumping” — selling a product at a cheaper price in one country than at home or in another country. ... Low demand for steel and decades of automation are the main reasons jobs at American steel mills are disappearing, https://www.vox.com/2018/3/1/17066838/white-house-trump-steel-tariffs Also for those with that severe TDS here some more FYI... “We’re on the brink of a potentially historic rebalance of America’s trade priorities,” Paul said in a prepared statement. “As we noted in a letter to the president this week and our cable TV ad, we are confident a robust steel trade action is good for our economy. A decision to retore sanity to global steel markets will help create domestic jobs and preserve our national security. https://agmetalminer.com/category/anti-dumping/ Now keep calm & eat a donut then take your meds for your severe TDS. U GO President Trump!. & Thank you.
" Whether they remain exempt would depend how much they bend in the current renegotiation of NAFTA. " Good ! That is the way to do it President Trump ! Those countries have been enjoying an unfair trade relationship with out country to the disadvantage of U S citizens and our President is correcting that. That is something that the Obama administrations did not even consider to be important.